Korea and Japan, two of the favorites to top the 2014 World Amateur Go Championship, both lost by half a point to their respective opponents from Chinese Taipei and China in the third round of the WAGC on Monday morning. China and Chinese Taipei then solidified their status as clear favorites by handily winning their 4th-round games Monday afternoon, with the Czech Republic’s Lukas Podpera (left) the only other 4-game winner, while Japan’s dwindling hopes were dashed by Canadian Yongfei Ge. Korea, meanwhile, kept their hopes alive with a 4th-round win over Hong Kong. Click here for complete results. 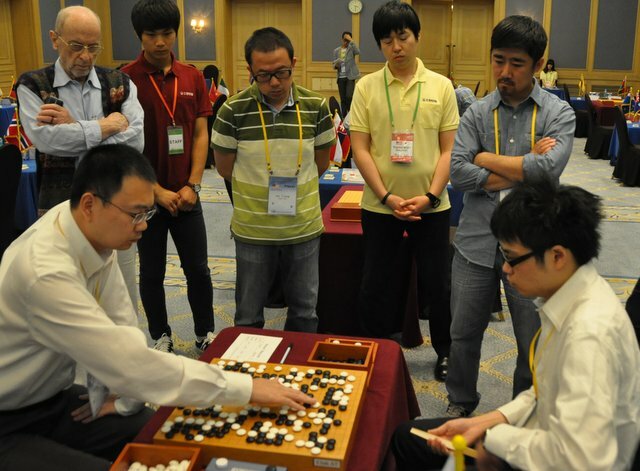 Korean star Taewoong Wei (at right), the clear favorite to win the first WAGC to be held in Korea, felt he had a comfortable lead coming out of the fuseki in the 3rd-round game, but young Yitien Chan (at left in photo) from Chinese Taipei came up with an unexpected play at move 98 that both agreed in their review later (click here for the commented game) gave Chan a winning position, although fierce and complicated play continued for another 200+ moves. Lithuania-Denmark: Comments/variations by the players, plus Pal Balogh (Hungary) & Fredrik Blomback (Sweden), in photo at left. Uncommented game records: Japan-China; Vietnam-Ukraine. In the 4th round, Malaysia’s Suzanne D’Bel (below, right) finally got the chance to show why the Japanese press call her “Tengen Girl”, drawing black and deploying her trademark tengen strategy. A fight erupted in the first few moves that engulfed the entire board, eventually leading to death and destruction, and the defeat of her Portugese opponent, Pedro Pereira (click here for the game record). 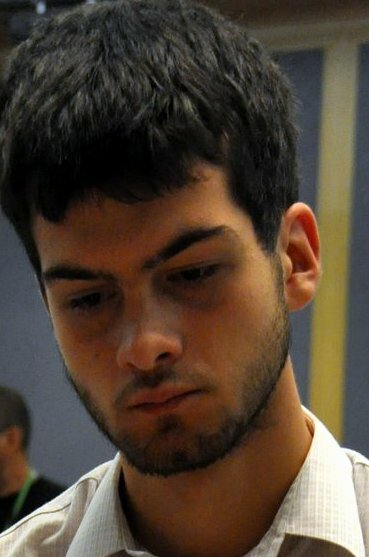 Meanwhile, Costa Rican system engineer Luis Enrique Boza Araya once again tried again to mimic D’Bel’s winning strategy but was clinically dispatched by his Swiss adversary Sylvain Gasana Praz. 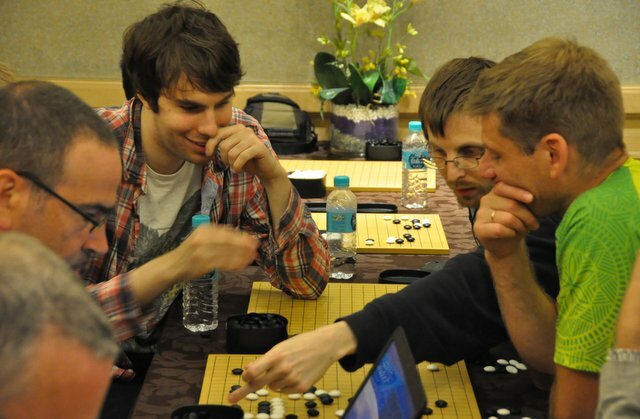 Canadian Yongfei Ge snuffed Japan’s Kiko Emura’s ambitions once and for all in an exciting 4th-round game in which Ge built – and defended — a gigantic central moyo. Emura went all in with a desperate invasion but it was not enough to shake Canada’s WAGC veteran (click here for the game commentary). Previous Round Updates: Yesterday’s WAGC report has been updated to include the Japan-Netherlands Round 1 game and we’ve also added the following Round 2 games: Belgium-Czech Republic; Taipei-Hong Kong; Korea-Canada. - Game reports by John Richardson, game records by Chris Garlock, photos by John Pinkerton and coordination by Ivan Vigano. Click here for Ranka’s complete reports on the third round and fourth round and here for complete results. Matches are broadcast live each round on WBaduk.